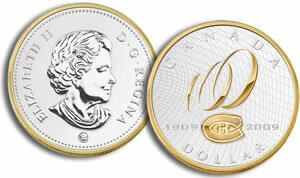 MONTREAL — After a century of dazzling legions of hockey fans, the Montreal Canadiens are themselves feeling pride and excitement at the Royal Canadian Mint’s official introduction of the 2009 Montreal Canadiens Centennial one-dollar commemorative circulation coin. 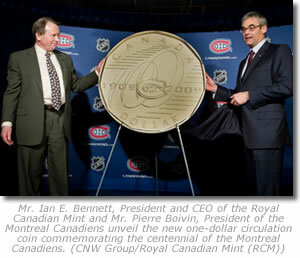 The coin was unveiled today [March 10] at Montreal’s Bell Centre by Montreal Canadiens President Pierre Boivin and Royal Canadian Mint President and CEO Ian E. Bennett. The Mint also unveiled a limited-edition Montreal Canadiens Centennial proof silver dollar enhanced with touches of selective gold plating, and presented two of these precious keepsakes to Canadiens Official Ambassadors Henri Richard and Réjean Houle. "The Montreal Canadiens have made an immeasurable contribution to Canadian sports history and the Mint is delighted to permanently commemorate this legendary team’s 100th anniversary through a special one-dollar circulation coin," said Ian E. Bennett, President and CEO of the Royal Canadian Mint. "The legacy of the Montreal Canadiens will be preserved from coast to coast as Canadians find this coin in their change and save it is as a treasured symbol of Canada’s glorious hockey heritage." "The Government of Canada is pleased to participate in the celebration of the 100th anniversary of the Montreal Canadiens," said the Honourable Rob Merrifield, Minister of State for Transport. "The legacy and traditions of great success in hockey are captured on this one-dollar circulation coin created by the Royal Canadian Mint and this coin will allow hockey fans across the country to be a part of the celebration." "The Royal Canadian Mint’s one-dollar circulation coin paying tribute to the centennial of the Montreal Canadiens is an exceptional addition to our team’s year-long centennial celebration," said Montreal Canadiens President Pierre Boivin. "The Montreal Canadiens hold a special place in the hearts of hockey fans across Canada and thanks to the Royal Canadian Mint, they can own a piece of Canadiens history every time they collect a 2009 Montreal Canadiens Centennial one-dollar circulation coin." Canadians fans across Canada can now look in their change for these new coins or visit www.mint.ca to find products such as a limited-edition roll of 25 coins retailing for $ 44.95 CDN, among other Montreal Canadiens Centennial collectibles. 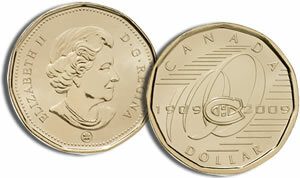 On March 11, 2009, Metro, Quebec’s largest grocery chain, will begin the exclusive distribution of the Mint’s Montreal Canadiens Centennial $1 commemorative circulation coin across the province. "The Metro grocery chain has a long relationship with the Montreal Canadiens and it is delighted that the Royal Canadian Mint has immortalized the Canadiens’ century of hockey exploits on a new commemorative one-dollar circulation coin," said Christian Bourbonnière, Metro’s Senior Vice President, Quebec Division. "As the exclusive distributors of the Mint’s one-dollar circulation coin commemorating the centennial of the Montreal Canadiens, we look forward to welcoming hockey fans in our Metro stores across Quebec and helping them collect this special keepsake." Today, the Mint also launched a special-edition proof silver dollar which is limited to a world-wide mintage of 15,000. It is available for $69.95 CDN in a clamshell case or $74.95 CDN, if customers choose an innovative acrylic stand simulating a well-worn ice surface. Selective gold-plating over the Canadiens centennial official logo and rim of the coin adds a rich contrast to its proof silver finish. This exquisite, limited-edition keepsake can be purchased at the Montreal Canadiens’ Bell Centre boutique, on-line at www.mint.ca, or by calling 1-800-267-1871 in Canada and 1-800-268-6468 in the United States. The Royal Canadian Mint is the Crown Corporation responsible for the minting and distribution of Canada’s circulation coins. An ISO 9001-2000 certified company, the Mint is recognized as one of the largest and most versatile mints in the world, offering a wide range of specialized, high quality coinage products and related services on an international scale. The Mint is an Official Supporter of the Vancouver 2010 Olympic and Paralympic Winter Games and has undertaken to produce the most extensive circulation coin program in relation to the Olympic Games ever conceived by any mint worldwide, while also offering limited mintage collector coins and sets. Visit www.mint.ca/2010 for Vancouver 2010 keepsakes and gifts. I have an uncirulated Canadian dollar. The front of the coin features Queen Elizabeth II with writing on the right side of the coin that says D G Regina. There is no date on the front of trhe coin. On the back there is a picture of a cathedral or a hotel and under the picture are the daTtes, 1876 1976. I am trying to find out what the value of this coin is. I received it 30 years ago.